Draft Concept Plan Master Plan Design was produced with positive collaborations between Resilience, Planning & Design and Mill City Park. When most people hear about the nonprofit Mill City Park, an organization working to bring a whitewater park to Franklin, they think about paddlers on the Winnipesaukee River. And the river, which city officials hope will draw whitewater enthusiasts from across New England, is an important part of the project, says Marty Parichand, executive director of Mill City Park. 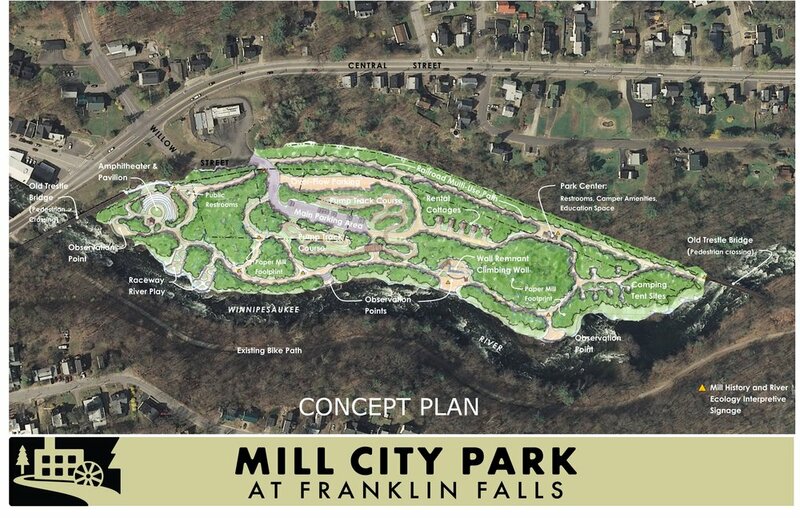 Mill City Park will house a community garden, pavilion, two public bathrooms, picnic areas, educational areas, hiking trails, a parking area, a climbing wall and a mountain bike pump track system, Parichand said. He envisions a tent-camping area, and a path that connects the existing Winnipesaukee River Trail on the other side of the river using the historic bridges, which are now unsafe to walk on. It will be the thread that ties the whole project together, Parichand said. The organization has been working on a master plan for the park and the river for six months, funded in part by a $5,000 grant from the Capital Regional Development Council and put together by Resilience Planning & Design in Plymouth. He said that report could be finalized by mid-December. “The master planning effort is all encompassing – it’s looking at the land aspect, and the water aspect, and how the two will interact,” he said. The master plan will help lay out how pieces like the sites of the old mills will be worked into the park. In a former life, Franklin was a bustling mill city. There are the sites of three former mills on the proposed park property that Parichand wants to incorporate into the park in an educational way that will allow people to see, touch and interact with the history safely, while also preserving it. One way to do that is through a proposed climbing wall on some of the old ruins on the southeastern end of the park. In 2019, Mill City Park will start clearing for the access road, which will begin off of Willow Street, and installing electrical and plumbing that will be necessary for the bathhouses. That work will be funded by a $200,000 grant from the federal Land and Water Conservation Fund and $200,000 in donations, which was approved in October. In the summer of 2020, work will begin on the park’s timber-frame pavilion. Once completed, Mill City Park will be the first whitewater park and outdoor recreation area in all of the Northeast. It will continue to work as a nonprofit and will be open to the public, Parichand said.